· SOLID PROTECTION: The propellers are protected with a high quality structure that effectively reduces collision impacts. · 360° Spin: Make amazing turns and turns at the touch of a button. Activating the LEDs will provide a better flying experience and greater visibility at night for stunts. · Built-in HD camera: allows you to record videos and take pictures. Capture your family or friends from an aerial view, shoot and view the world from a new angle. The KASO K88es is controlled by an interference-free 2.4GHz transmitter. The signal from other uadcopterswill not interfere. · Technical data: Net weight: 0.42oz/12 g (Mini Quadcopter) 6.45oz/183 g (Min Quadcopter + Transmitter) Material: Environmentally friendly plastic Charging time: 30 min Flight time: 4 - 5 minutes Battery: 3.7 V 100mAh Polymer Drone Lighting: More colors in LED Lights Remote Control: 1181, 1/30 m Mini Drone Dimension: 1.57 x 1. 57. 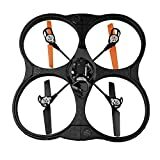 X 0.78 in./4 x 4 x 2 cm, Remote Control Transmitter: 3.54 x 2.36 x 1.57 in/9 x 6 x 4cm Package Dimension: 3.15 x 3.15 x 4.72 in./8 x 8 x 12 cm Package Content: 1 * Quadcopter 1 * Remote Control Transmitter 4 * Spare Propeller 1 * Bracket 1 * USB Charging Cable 1 * Protective Screwdriver 1 * Rok1 * Warranty Card Key Hexagonal 1 * Operating Manual (EN/DE/EN/IT/FR/JP) Note: This Nano Drone is not suitable for children under 8 years. Please read the manual before starting. Note: The USB cable shines on, when the battery is charged please make sure the charging drone is off.